Hawaii Ironman - October 16th 2004. A hard days graft! "Well my build up for the race was far from perfect for sure during the year... It had started so well early season and I was in shape to run about a 2.40 marathon 2 weeks before the London Marathon when disaster struck in the form of a knee injury (patella tendonitis) that pretty much had me off running for the 5 months from the end of March 'til the end of August. It had been recurring every time I tried to get back running again. It also was aggravated by my cycling so that too had to be abbreviated in the build up to allow it to heal. So I would definitely be lacking any decent training mileage going into the race. Anyway at last it cleared up and with exactly 7 weeks of run training in my legs and a longest training run of just 14 miles behind me, the time had run out for training and what was there (or what wasn't there!) would have to make do! In the days before the race, I checked out the course with my friend, Andy Blow, that I was sharing an apartment with. The swim course looked fantastic... as warm as a pool and just as clear (clearer than some I've swam in in fact!) It was a little like swimming in an aquarium with all the tropical fish around! The bike was definitely gonna be hard. The heat and the strong changeable winds were going to be the biggest factors I suspected to cause damage. Nothing too hilly to speak of, just lots of long undulations on this primarily out and back course. The run to, would also be tough, again the heat would make it hard. With the majority of the run course on the featureless Queen K highway it would also be tough mentally ticking off the miles. Anyway, as the week passed both Andy and myself were feeling ready to do battle. I'd left England with a fluey bug that I'd picked up 9 days before the race but with 2 days left to go 'til race day I'd shaken it off completely just in the nick of time, thanks to Benylin 4x a day!! Got up at 3.30am, showered and stuffed my face with toast and cereal till I was as full as I could take! With an 11 hr time difference from London and only 6 days before to adjust, the early morning start wasn't really a problem as I'd been waking at 5-6am most days anyway. Looked outside and it appeared to be a clear sky with all the stars on view... just what we didn't want really... clear sky = more sun and hotter temperatures etc.! We (my friend Chris, Andy, his girlfriend Rachel and myself) walked the 1.5miles from our condo to the start in the pitch black of night. We were joined by many other athletes trundling their way down Alii Drive towards the start. Nerves were starting to build for sure at this time with thoughts of the immense task that lay ahead of us. After 2 more visits to the loo, we queued up to get our race numbers stencilled on our arms and legs... no marker pens here, literally number stencil kits with thick black ink to apply our identity for the day... it was like a military operation! Took over half hour to finally get through that then it was off to check on the bike, put some more air in the tyres and go through the last minute ritual of preparations. After one last visit to the loo, it was 15 mins left to go til the start... had heard the pros starting their wave at 6.45am whilst I was sat on the loo! Got to the swim start area to find massive congestion and everybody panicking to get in line to enter the sea. Finally with 3 mins left til start time I went down the stone steps to enter the sea. A bit of a mad 100m rushed swim out to the start line saw me push my way through to the front row and assume my position... this was no time to be polite and coy about pushing through the crowded swim to get to the front... I didn't wanna get caught up with the slow swimmers at the start to hamper my race. At 7.02am (2mins late!) the gun fired and we were off... this was it, I was finally starting my 1st Ironman race at Hawaii... 26 years after it had all began back in 1978. I swam hard for the first 400m or so to try and get some free water and this seemed to work as I got hit very seldomly from the other swimmers. As I settled back in my rhythm slightly, my mind wondered what lay instore for me later on that day? The swim course was 2.4miles long (3.8km) and was basically like an open box shape with the turn points being 2 large boats at the far end of the course. After about 15 mins I started getting a pain in my right hip flexor... an area that had been bothering me since May but never in the swim before. I hoped it wasn't a bad early omen? Caught a sneaky glance at my watch at the 1st turn boat... 27 mins exactly. That was on course for my planned 57 min swim. Caught a few more blows as I made the 2nd turn boat to head back to the shore but nothing serious. It seemed like an age swimming back to the pier and all the time the pain in my right hip flexor was getting worse. Tried not to kick my legs at all to ease it slightly but it still persisted quite strongly. Eventually I hit the welcome sight of solid ground and scrambled ashore in 57.50... exactly on schedule so was happy with that! Managed to navigate my way through the mad world of collecting my bike kit bag and then the changing tent before finally collecting my bike and heading out onto the road... was at 1.01 getting on the bike, about a minute behind planned schedule but nothing much to worry about at this stage. A little loop followed by a short out and back section of road brought us onto the Queen K highway at about 10-12 miles or so... leaving just the 100 or so more left to go! I didn't want to make the same mistake as I had made at Austria Ironman in July, by working too hard on the bike ride so had planned to stick to an average heart rate of 145 throughout with alarm bells ringing if I went above 155 at any time! I'd also planned to increase both my fluid intake and food intake throughout the ride plus a new addition to me for any race... salt tablets on the bike every 30 mins to prevent something called hyponatraemia. That is when you sweat so much that you lose the sodium and potassium you need to prevent cramping up in the latter stages. So my schedule was eat every 20 mins (usually a gel) plus drink constantly (Gatorade and water) and not forgetting to swallow the salt pills as if they were a multivitamin! It was all carried out with military precision!! My well-researched plan was to ride between 5hrs 25mins and 5hrs 35mins in total. Looking at past results I should have been well capable of that barring disasters... or so I thought! 5hr 35 mins would be holding an average speed of 20mph and the nearer to 21mph I got the better the time! After about 25 miles I was nearly up to 21mph and was feeling very steady indeed. My natural instincts wanted to ride quicker but I said to myself this time I wouldn't deviate from the plan! At about 25 miles we hit a big headwind on the Queen K, dropping my speed down to 14-15mph. This was really hard to deal with and by the time I got to the 60m turn at Hawi my average was a lowly 17.5mph! I was still feeling full of energy though and told myself what an easy ride I would have back with the massive tailwind I was due. Surely that would pick up my average speed once again to over 20? Well for the next 8 miles or so I was flying along at between 25 and 35 mph... average had climbed to 18.5... looking promising! I took an age in T2 to get changed (7.07 to be precise!) and took my time to apply sunscreen, douse my head with ice and also visit the portaloo so as to start the run with an empty tummy!I walked to the timing mat and worked out I had 3hrs 46 mins left to get under 11 hrs. My original goal was sub 10hrs but a 2.46 marathon was def not on the cards that day for sure!!! Because of my lack of running training I was worried how I would cope in the second half of the run course and thus didn't want to change my strategy now in case I ran into trouble later on. So after 2 more visits to the portaloos at miles 13 and 18 I had seen my early time buffer (thanks to the 7.45 splits) disappear and I was now on course to come home in 11.02! Bugger!! For me being outside 11 hrs was a total disaster and even accounting for the strong winds on the bike I didn't want to come back home with a time that started with 11 something! So I now had a choice... I could either give in to 11 or try and fight back? I chose the latter and even though I was getting tired I tried to up my pace again. By this time the heat of the day had gone and it was much more pleasant to run in again. I started to get my splits under 9 min miles again but still needing to stop for fuel at the aid stations. By 22 miles I was still behind schedule and I knew it was gonna be a close call as to whether I could do it or not. My strategy was to miss out all remaining aid stations and head for home. Next split was 8.05 then another just over 8 mins. With 2 to go I had got the bit between my teeth and was passing as many people as I could as well as not being overtaken. At mile 25 I realised I was safe to break the 11 hr barrier and I was actually riding on adrenaline and the noise from the crowds as I neared the finish. I found some spare energy from somewhere to knock out a sub 7 min mile pace as I approached the last quarter mile down Alii Drive to the finish. I felt so strong then it was unbelievable... almost as if I could have ran another 10k at that same speed? Finally crossed the line with nearly 3 mins to spare... 10hrs 57 mins and 12 secs! A 3.43 marathon. Again a little adrift of the planned 3.25 effort but under the circumstances I didn't really mind too much, but was just glad to be home safe and sound with just 2 black toenails (and sore legs and sunburn!) to show for the pain! So there you go... that's my story. There were 1700 or so other stories to tell that day, some good and some bad. At least I finished and looking through the results I didn't do too badly considering... 466th overall and 16th British finisher out of 52 starters. 44 mins behind the 1st Brit isn't too bad after such a long day and hampered abbreviated build up. About 35 pros ( a quarter) dropped out the race and there were 160 DNF�s overall which is the highest percentage the race has ever had mainly due to the severity of the winds on the bike course. I don't know if I will ever attempt to qualify and go back there to race again. Its an amazing feeling being there and something I will never forget but its such a lot of hard work and sacrifice to get in shape to do myself justice... be nice to go back though when the wind is a little kinder to me! Thanks to everyone who wished me good luck for the race and to those who tracked me on ironmanlive.com. Hopefully some of you will also have your chance to race at Kona one day in the future? Maybe I can be your volunteer/helper? The weather was very good and there were about 400 riders taking part.Everyone was issued with a chip timer which you place around your ankle and your individual time is recorded as you go over the start line and again when you finish. Ian and I started about half way through the field and went off quickly looking for a group to sit in with. We never found a good group, however, although we did pick up a few "hangers on". People seem to be able to spot Ian as a 'good wheel to follow' - if they can. Unfortunately we managed to miss a turn and ended up going around a loop again in front of a surprised marshal costing us a few extra kms. A few times we thought we had a good group but every time we came to a hill Ian would keep the speed high and by the time we got to the top there were just the two of us and a couple more chasing to get back on. One guy in a very bright pink ONCE top blew up spectacularly on a hill! After around 80km we were stopped at a set of traffic lights when a group of around 15 or so caught us -once the lights went green Ian and I chased back on (they went through on red!) - now maybe we could get them organised. With some cajoling we managed to find 6 or 7 who were willing to work and we made some reasonable progress. I suggested to Ian that he take it easy and wait for a hill and then try and lose them - the plan worked well. At the next hill Ian was already at the front and started to pile on the coals - he even got out of the saddle and accelerated away. I had to go as hard as I could to stay in touch and by the top there was just one other guy with us and the rest were no-where. The three of us continued on with Ian, as ever, doing the lion's share of the work. At one stage the other chap did ask Ian why he wasn't in Spain giving Floyd Landis a kicking. As we neared the finish the other chap and I groaned as we recognised the road and knew we were going to go up a monster hill from Underriver to Godden Green. The climb is about 1km and is very steep, Ian disappeared and we grovelled up on the granny ring as best we could. At the end Ian finished 2 mins ahead of us 4 hours 6 mins - look out for the results in Cycling weekly. A very enjoyable ride. Ian Morgan and I (Paul Martin), together with Rob Frost left on Friday afternoon to go and take part in the Tour of Piccardy cyclo-sportif in France.� This is a ride of 187km with around 1500 metres of climbing with around 2000 cyclists.� The ride starts and finishes in Abbeville which is only an hour from Calais. We arrived around 7:00pm and went to sign on, pay our money and pick up our transponders and our numbers for our bikes�- all very simple.� The transponder is placed around your ankle and triggers the sensors on the start and finish line so that you get an individual time.� We then found our hotel and headed off for some pasta to fuel our bodies for the next day.� There were many other Brits in our hotel and in the restaurant as this ride is easy to get to popular with some clubs. Early start the next day and our usual breakfast of cereal, rice puddings and hot cross buns and then off to the start.� The start is laid out with very large pens, the 1st pens is for the elite riders in each category and also riders from the local club who help organise the event, after that the pens are sequenced by bike number depending upon when you entered.� We lined up in the 2nd pen and waited for the start. At 8:00am we were off.� The 1st 8km is neutralized and the race is led by a lead car - however even at this stage the leaders were doing 45-50 km /hour and it is very hard to work your way through the bunch at that speed.� The route is fully marshalled with many motor cycles going up and down the course and Mavic cars/vans placed along the route to deal with any mechanicals. After the neutralised section there are a couple of short sharp hills which break the big bunch up into many smaller bunches which then form and move along at high speed.� Ian and I were fairly close together here and were in the 1st 150 riders or so.� A few hills later and Ian had worked his way into 1 of the groups up the road and was making good progress.� After 25km or so things had settled down and going up a hill I saw Ian at a mavic car fixing a puncture.� He replaced the tube but then when he inflated it found that the tyre split.� At this point the mavic guys gave him a replacement tube/tyre (no charge) and got him on his way. I carried on in the group I was in,� every time we went into the strong wind there was a struggle to get shelter and people were riding in the gutters.� The standard of riding is very good as many of these people ride these events every week.� After 100km there was a feeding station, however, I didn't stop as if you stop you will not get back on your bunch.� After another 20km there was a water point where they were handing up bottled water - I managed to get 2 bottles which was a relief as I had run out of liquid and managed to decant the water into my water bottles.� Shortly afterwards I started to suffer and dropped off the back,� I carried on my own for 10km or so and then got swept up by another bunch.� I managed to stay with them for a while but then blew up spectacularly.� I then struggled on at a very slow pace watching my average speed come tumbling down.� I stopped at the last feeding station, picked up some more water and a banana and started to feel better and now only had 20km to go. Meanwhile Ian had been making good progress although most of the faster riders were in front of him.� He got in a bunch for a while (doubtlessly doing most of the work on the front) however at 100km they turned off for the shorter route so for much of the way he rode on his own.� Not easy on an exposed course with a strong wind. With a few km to go I heard a familiar voice behind�me - it was Ian.� I got on his wheel and he dragged my the last few km to the finish sweeping up another rider on the way.� With 200 metres to go I used some very sneaky tactics and went around Ian to go over the line just in front of him - a win is a win! Rob Frost was already at the finish as he did the 135km route and we laid out on the grass (collapsed on the grass?) and ate our complementary pasta, salad and sweet and picked up our certificates. All in all a good days ride, excellent organisation, great marshalling and a good atmosphere with 2000 participants. Ian Morgan, Lee Wingate and Paul Martin rode the Liege-Bastogne-Liege ride in Belgium on Saturday which if you are doing the 240km ride is the same route as the pro classic in April and includes 3600M of climbing. Normally this ride is very sunny and hot and has over 3000 participants. "This year as we arrived at the start @ 6:00 am it was already raining and it carried on for most of the day. Although not a race the pace was high and the first climb was after about 5km and rose 220M which was enough to split the field into small groups by the top. After 65km and 1200M of climbing we reached the first checkpoint. Lee was already feeling the pace and opted to go for the 175km route at this point. Ian and I carried on in a group of around 20 towards Bastogne, there were some hairy descents in the wet conditions and the riding was fast until the next checkpoint in Bastogne at 110km, here I had a tin of rice pudding which the organisers were giving away which kept me going for the next few hours. On the next leg Ian was feeling strong (as ever) and on the climbs would just keep pounding his big gears making the rest of us suffer. He definitely didn't make any friends at the back of the group as they gradually dropped away muttering something about the English. I was feeling relatively good until around 150km and I had managed to stay with Ian, at this point though I started to suffer and Ian eased off and waited for me. Up to now we had only done 2 of the official climbs but had nearly 2000M of climbing under our belts! In the last 80km there are a series of tough climbs (Cote de Wanne, Haute Levee, La Redoute) with steep sections some as much as 21% and very little time for recovery in between. On La Redoute there were many names painted on the road and with the rain it was hard to stop your back wheel spinning on the steep sections of the climbs. From the top of La Redoute there is a 30km downhill/flat run-in to the finish where groups form and it becomes a road race. At the end Ian and I sprinted across the line after 9 hours 15 mins of riding and found out that we were 20th and 21st of the riders who did the 240km ride - not bad." The Twilight Trophy is probably the most hard fought trophy in the club with riders taking their best twelve events out of a total of fifteen. A total of twelve riders competed and in the end there were only three points separating the top two men with the Ladies Champion just behind. Paul Martin made the early running winning the first week but was soon overtaken by Chris Burley and chased hard by Julia Freeman who missed the first week. Chris lead until week five when he missed a week and was overtaken by Julia. This was short lived as Julia missed the next two weeks (weeks 6 and 7) and Chris was again back in the lead. Paul had missed two weeks but a run of good results saw him regain the lead by week 8. Andy Ballentyne meanwhile was improving steadily and with three wins in three weeks was just one point behind Paul by week 11. Paul and Andy were neck and neck for the next 3 weeks when Andy moved into the lead. With Andy just two points ahead of Paul with two events left, the Mens Trophy came down to a nail biting finish with Andy needing to win the final event to clinch the series overall. Andy however was going to miss the penultimate event (week 14) and Paul miss the last event (week 15) due to holidays and so everything was still to play for. Only two riders rode week 14 - Paul and Dave Spencer, and with Paul getting the better of Dave, went back to the top of the series. This meant Andy needed the full 20 points in week 15 to win but with Mark Edmonds deciding to ride, this proved to be too great a challenge and in the event was 2nd equal with Julia and therefore 2nd overall - three points behind Paul. Paul Martin and three others from Paul's firm - Alan Swinhoe (who did the End 2 End with us last year) Lawton Chen and Steve Kemp have just returned from the French Alps where they all successfully completed La Marmotte.� The weather was sunny and hot for the 2004 edition of this event.� There were around 6000 starters who left Bourg d'Oisans at 7:15 on Saturday morning and by 20:30 that evening 4436 of them had completed the course and made it to the summit of Alpe D'Huez.� The route is 174km long and takes in 4 major climbs (Col de Croix de Fer, Col de Telegraph, Col d Galibier and then Alpe D'Huez) totalling 5500 metres of climbing. Lawton Chen and Steve Kemp both achieved the times required for Silver medals which is a great achievement as this was the first time at this event for� both of them.� Alan Swinhoe managed to improve on his time from 2000 by 3 hours to also get a silver medal. Well done. "4 of us travelled to the Alps Wednesday. Two of the party had completed the Marmotte previously; one was a regular, having won a gold medal several times previously; the other, a marathon runner, had completed 4 years prior. Arrived at Alpe D'Huez (1860m altitude) around 17.30. Our lead declared we were going straight out to descend and then cycle up Alpe d'Huez. Having just scared ourselves driving up it, somehow this didn't seem like a good idea! At 35 degrees centigrade, and after 12 hours in the car, it felt unbelievably hard. 13km took me over one and a half hours. My heart rate monitor went berserk! Thursday was spent riding some of the 'more gentle' climbs in the area (!). Practicing 8-10% climbs actually helps, and I started to feel the "La Marmotte" was at least technically possible, if only I could find the endurance. The whole region was full of similar foolhardy folks on bikes preparing for the 'big Saturday'. The event draws people from all over Europe, with big contingents of Dutch, Danes, and even visitors from the 'new world' continents. Friday was spent chilling out, a gentle ride around the top of Alpe D'Huez, loading up on Carbohydrates, and polishing ("if in doubt, polish!"). A highlight was watching planes land at the short (>500m) mountain port, and then take off again, literally flying off the side of the mountain. Gulp! Saturday arrived with clear weather, and a good forecast. Breakfast on the chilly balcony at 5.00am in the dark dawn overlooking some incredibly spectacular mountains seemed surreal given what was about to take place. We left at 6.00am on the bikes to once again descend Alp D'Huez for the 7.15 start; it was still dark, and cold and the wind chill at 40mph downhill made it really uncomfortable. The mountain was packed with people all heading to the start, and made the 20min descent more like driving on the M25! White van man ruled there too! The start was simply amazing. Nearly 6000 people had turned up for the event, and the staggered start was accompanied by the heavy bass-line of 'we are the champions' booming across the town of Borg D'Oisans at 7.15am!!. Little did we know, but of the 6000, only 4000 were to finish later in the day. The course sped towards the first climb. Every direction one looked (mostly up!) was one long stream of race bikes. The first climb was a little over 1300 meters of almost continuous skyward ascent! It took around two and a half hours. Descending was no easier! Many times I saw folks being attended to by ambulances, presumably having missed a braking point, made too ambitious a lunge on a fellow competitor, or just been plain too fast for the amount of road left in that particular hairpin. Descending to around 500 metres only means one thing - having to go up again. The next two climbs follow one another, and represent 4 hours of agonising and almost impossible grind up the mountain. A total of 2100 metres to the top of the infamous Col du Galibier. To quote Eddy Merkx - "it goes on so long and so high, I thought I would see Angels! ".Above the tree line; then above the snow line. Grabbing handfuls of snow from the banks lining the road and showering it inside my shirt and down my back to cool off seems foolhardy now, but I remember it as heaven at the time! I was ahead of my schedule by at least 45 mins (although by now simple maths had become really quite hard! ), but that was an incentive to push harder for the last 3-4 hours. This time the descent was even more scary. The road surface was poor in places, the gradients really steep, and with no barriers around the hairpins, my thoughts more than once turned to those planes launching themselves off the cliff-edge at the mountain-port! The final climb of the day was back up Alp d'Huez. By now I had sufficient time to feel confident that one way or another, mechanical disasters aside, I would finish. However, I was within a shout of a medal, and made a last mad dash (for 1 � hours!) up the mountain. I remember stopping at one of the 21 hairpins and ditching everything I didn't need! I came very close to throwing the jacket I'd bought only a week or two prior over the side in an attempt to shave off another 150 grams of weight! The finish was a very welcome sight; and ironically, I ended up in a queue to get across the finishing line as a couple of riders ahead of me were 'faffing about' presumably too tired to rush any more. The total climb is equivalent to cycling up 2/3 of Mount Everest in a day. Total distance is 175 km. My Average speed was 15.71 km. It took me just under 11 hours. This was the hardest thing I think I have ever done in my life. Of our 4, one got (another) Gold medal; three of us got silver. One beat his best prior time by well over three hours. I want to say an enormous well done and thank you to Paul, Alan, and Steve. I could never have done this without them." August 14th Liege - Bastogne - Liege - cycle tourist version of famous Belgium bike race won several times by Eddy Merkx.� Distances from 125km to 240km - very good route (quite hilly), around 2000 participants. Leave Friday back Sunday. Details of these and other rides are on the attached spreadsheet. On June 19th and 20th, 3 generations of the Martin family will be cycling the Devon Coast 2 Coast route (105 miles) in aid of the Lymphoma Association - my mum and dad, myself and my son Jim aged 11. The ride starts in Ilfracoombe and goes down to Barnstable, Hatherleigh and then goes over Dartmoor to Okehampton and Tavistock before going down to Plymouth. We are looking to raise �1000 for the Lymphoma Association - helping sufferers of this form of cancer. Don joined the Club in 1959, having previously been a member of the Rosebank C.C. He is one of those unsung members who are the backbone of any club. Don was a stalwart of Club runs for many years. He was never very fast, but was always there at the end of a long hard ride. He is an excellent touring companion and has toured extensively throughout the British Isles and in many countries throughout Europe. Don is always around to support Club functions, marshal and work at the Country H.Q. Saturday 14th February saw the 69th edition of the annual club dinner and dance, which was held at the village hall in Ugley. A number of club members and friends of the club made the long trip out to Ugley. Before the meal Bill produced a 'chain of office' for the new club president, Don Jones. It was presented by the outgoing president, Alan McGuiness, who seemed a little disappointed not to have had the chance to wear the chain himself! A well appreciated four course meal followed a number of witty and humorous cross-toasts (mainly by Bill). Once we had eaten and were all well satisfied, Linda Johnson welcomed the club's visitors and then Alan responded, entertaining us with some cycling anecdotes. The speeches were followed by the main event of the evening, the prize presentation. Len and Wendy organised the trophies and Don made the presentations. It was disappointing that a number of trophies were not presented due to a lack of active riders. Peter Allet was hired to provide the music and he tempted a surprising number of people onto the dance floor with a medley of disco classics. To conclude the evening a raffle was held. Thanks are due to Richard and Liam who managed to sell more tickets than we actually had! The luck was mainly with Ron Neal whose number came up several times. The prizes were varied and all of the winners found something that they really wanted. Many thanks to Bill who organised the event. 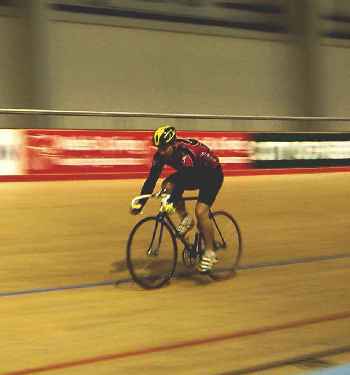 Four members of the club made the very wet and windy journey to South Wales to try out the new velodrome in Newport on the weekend of 31st January and 1st February. Paul Allet, Andrew Ballentyne, Stuart Evans and I were the riders and we were accompanied by Linda, Felicity and Lisa. Three groups of ability level were available; novice, intermediate and expert. Andy rode with the experts, Paul & Stuart with the intermediates and I rode with the novices as a first time hard track rider. The weekend was organised by Jeff Wade of the Chelmer. He had several activities prepared and a coach was available for each group. The weekend began with a number of warm-up sessions to get used to the track. I began extremely warily and nervously but after a couple of laps felt more confident and managed to get above the black line. Andy and Paul were already riding round with confidence above the blue line. Stuart didn't have the best of starts and in the confusion of the first few laps collided with another rider, bent a number of spokes and hurt his shoulder. After a short time he was back on his bike but it was clear that his injury was quite serious and he didn't ride any more for the weekend. Meanwhile, Andy and Paul were moving between the intermediate and expert groups. Andy was showing his experience at the front of the bunch and leading some of the activities and Paul was showing the speed of his sprint. I was gaining in confidence but still hanging at the back of the novices group. Felicity, Lisa and Linda spent the afternoon sampling the delights of Newport but returned somewhat unimpressed with the Welsh version of 1970's Romford! We stayed at the Newport Holiday Inn on Saturday evening which was very comfortable and where we enjoyed a substantial dinner. After an evening in the bar there were a couple of sore heads in the morning but nevertheless, everyone took full advantage of the breakfast buffet. The following morning's riding was mainly race based. Unfortunately, Stuart was still unable to ride but Andy and Paul again mixed it with the experts. I was still riding with the novices but could now ride above the blue line and so was able to join in with the racing more easily. We all had some measure of success and ended the weekend with sore legs and broad smiles on our faces, looking forward to the next track session. It is with great sadness that we record the death of Don Morrison, who passed away on 23rd January 2004, aged 80. His funeral at Chelmsford Crematorium on 4th February was attended by a large group of Club members, led by the President. 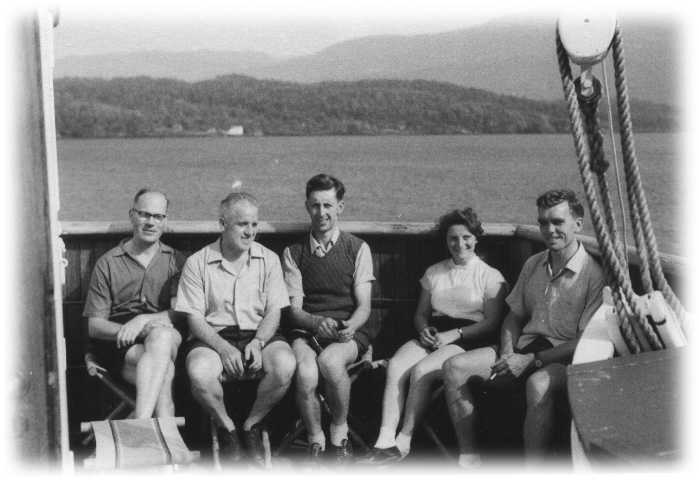 A floral tribute was sent and our condolences expressed to his wife Marjorie, whom he married in 1967 and stepchildren Malcolm, Susan and Gerald. Marjorie has telephoned and expressed her thanks to all those who attended. It was Don's wish that his ashes be scattered at the Country Headquarters and it is planned that his family will perform this ceremony on the afternoon of 4th April, following the Club Open Hilly time trial. Don joined the Club in 1947. He was a strong rider, regularly supporting club runs and a keen tourist and time trialist. He led the building of Country Headquarters in 1959/60. He carried out much work for the Club over many years being Runs Leader, Social Secretary, General Secretary, Gazette Editor and Country Headquarters Secretary at various times and served as President from 1978 to 1981.